On November 4, 1858, James Ross Snowden recommended to Howell Cobb, secretary of the Treasury, the adoption of a new Indian head design, by Chief Engraver James B. Longacre, to take effect on January 1, 1859. It was believed that the balancing of relief parts, the obverse center with the Indian head and the reverse with a thin wreath around the edge, would result in a better metal flow. Previously, a number of pattern variations, including a flying eagle redesigned to be much smaller and more delicate in size (so-called "skinny" eagle), were struck in an attempt to remedy the problem. Production continued apace, and by year's end 36,400,000 frosty, golden-colored cents had been produced for circulation. In addition, hundreds of Proofs were struck for collectors; just how many Proofs is not known, but the Guide Book of U.S. Coins estimates 800. Collecting 1859 Cents Enough 1859 Indian cents were made that specimens are generally available today in all grades from well-worn to Mint State. Most specimens in the latter category are well struck and quite frosty. As might be expected, Proofs are very elusive, especially if in Proof-64 grade or finer. The 1859 cents with the Indian design on the obverse and the laurel wreath motif on the reverse were produced for only this one year, as circumstances unfolded. On December 13, 1859, Mint Director James Ross Snowden advised the secretary of the Treasury as follows: "A modification of the devices on the reverse of the cent is desirable. I propose to introduce the shield upon the reverse. This will give it a more National character, and be a decided improvement upon the present coin. I enclose a few specimen pieces I have caused to be struck..."
In the following year, 1860, a new reverse embodying an oak wreath surmounted by a shield was adopted. Striking of Indian cents on thick copper-nickel planchets continued through early 1864. Production was fairly generous through the span, and ranged from a high of 49,840,000 business strikes in 1863, to a low of 10,100,000 in 1861. The high mintage of 1863 is explained by the extreme shortage of circulating coinage at the time, due to hoarding by private citizens who were unsure as to the Civil War's outcome. The shots at Fort Sumter that launched the Civil War didn't ring out until April 12, 1861, but preparations for war were under way well before that—including economic preparations. Anticipating the conflict, Jittery Americans on both sides of the Mason-Dixon Line began hoarding gold and silver coins. The pace of this activity accelerated following the election of Abraham Lincoln to the presidency in November of 1860, for he was perceived as a hard-line Unionist unlikely to compromise with southern politicians. It reached fever pitch after Dec. 28, 1861, when New York banks suspended special payments in reponse to the issuance of federal paper money which was not redeemable in coin. By the summer of 1862, precious-metal coins all but disappeared from circulation. Not being made of precious metal, cents continued to circulate for a few months longer. In fact, it seemed inconceivable that Americans would hoard cents. 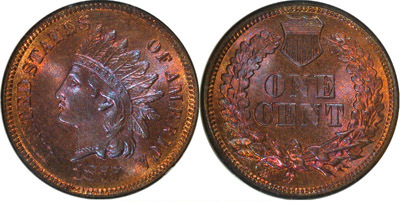 The large, intrinsically valuable copper cents used since the start of the nation's coinage were replaced in 1857 by the smaller copper-nickel Flying Eagle cents—fiat issues, worth less as metal than as money. That was unusual in the mid-19th century; most U. S. coins had high intrinsic value, and Americans had come to expect and even demand this in their coinage. Nonetheless, the public had welcomed the large cents' demise, considering the coins too cumbersome for ordinary use. The new small cents-known as "white cents" because of their pale color—became even more popular in 1859 when, due to striking problems, the Mint replaced the original Flying Eagle design with a new one depicting a female clad in a feathered Indian headdress. This "Indian Head" portrait, not a native American profile but apparently modeled after the Greco-Roman statue Venus Accroupie, had widespread appeal, reinforcing the acceptance the white cents already enjoyed because of their handy size. Production levels were high—far higher than those of the large cents they replaced—and it was commonknowledge that the metal in each coin was worth less than one cent. But the Civil War shattered many accepted beliefs, including the perception that small-size, low-value cents were immune from hoarding. Initially, bags of cents served as one of the primary means of payment for harried merchantsdeprived of silver coins. Before long, however, the cents too became a target for hoarders. They were, after all, government-issue coins, and as such were preferable to the all-but-irredeemable "shinplasters" (scrip and wildcat bank notes) being widely offered. Furthermore, the price of nickel-fueled by wartime demand—was rising quickly, giving these nickel-alloy coinsgreater intrinsic value. By December 1862, cents had joined gold and silvercoins on the shelf. That was when necessity gave birth to invention—not by Uncle Sam but by private entrepreneurs. To fill the vacuum left by the departure of federal coinage, merchants and promoters began producing cent-sized bronze tokens, generally bearing an implied or even explicit promise of redemption in goods, services or money. These "Civil War tokens" gained broad acceptance as a money substitute. Mint officials were duly impressed, and in 1864 they reshaped the cent in these tokens’ image, replacing the copper-nickel "white cent" with a slimmed-down version made of bronze. Besides being darker in color, the new cent was one-third lighter in weight. Its diameter was unchanged, however, and it still bore the same Indian Head obverse design and simple wreath and shield reverse fashioned for its predecessor by the Mint’s chief engraver, James B. Longacre. The new coin’s components were less expensive than nickel, and this combined with its lower weight made it much cheaper to produce. It was also easier to strike, as bronze is much softer than nickel. And like the tokens it successfully replaced, it enjoyed ready acceptance from the public, effectively ending the shortage of cents in circulation. Both kinds of cents were issued in 1864, withthe bronze outnumbering the copper-nickel by about 3-to-1. Despite its higher mintage, the bronze cent provided the year’s scarcest variety: one on which Longacre’s initial "L" appears on the ribbon of the Indian’s bonnet. The designer didn’t add this until late in the year, so relatively few 1864 cents have it. Apparently, a large quantity of these "L" cents went to England, for many pieces were recovered from there in the 1950s and 60s. Total mintage for the series reached almost 1.6 billion, along with 96,848 proofs. Annual production topped 100 million only once, in 1907, and sank below one million for just two issues: 1877 and 1909-S. At 309,000 pieces, 1909-S has the lowest mintage, but the 1877—at 852,500—is more valuable, because fewer examples were set aside. Other scarce issues include the 1869 with a doubled 9, 1872 and 1908-S. Proofs were struck every year, usually in the thousands, except for the earlier years which saw mintages under 1,000. The 1864 coins had the smallest proof mintages: 150 for the no "L" variety and only 20 for the with "L" coin, making it a major rarity. Counterfeits exist, particularly of coins dated 1877 and 1909-S, and to a lesser extent, the 1864 "L", the 1866 to 1878 issues and 1908-S. Questionable pieces should always be authenticated. Mint state examples exist in substantial quantities in grades up to MS-65, but their population drops sharply in MS-66 and above. Fully red coins, of course, are rarer still. Although the series is relatively long, it encompasses just 51 pieces—even including 1864 L, 1869/9 and the Open 3 and Closed 3 cents of 1873—because there are only two branch-mint issues. Given this fact and the limited number of high-priced rarities, many collectors assemble complete date-and-mint sets. The series remains one of the most popular of all United States issues. In 1864 the thin bronze Indian cent became a reality, and millions were struck for circulation. Apart from the metallic composition and weight, the Indian cent appeared the same as before; the obverse and reverse designs remained unchanged. Toward the end of the same year a small refinement was made to the Indian design. The initial L, for Longacre, was added in an almost imperceptible location on the ribbon below the lowest feather in the Indian headdress. Coinage of the Indian cent continued through 1909. Among Mint State Indian cents of the 1864-1909 years, the scarcest are those dated from 1866 through 1878 inclusive. The 1909-S was minted in low numbers (just 309,000 pieces), but enough Mint State coins were saved that today there are more Mint State 1909-S cents around than there are Mint State examples of, say, 1868 (mintage: 10,266,500 pieces). Among Proof Indian cents, the scarcest are those dated prior to 1878. The Guide Book informs us that only about 20 1864-L and just 150 1864 bronze (without L on ribbon) cents were made; both of these are rare, with the 1864-L being a formidable rarity. 1996.Breen, Walter, WalterBreen’s Complete Encyclopedia of U.S. and Colonial Coins, F.C.I. Press/Doubleday, New York, 1988. Snow, Richard, Flying Eagle & Indian Cents, Eagle Eye Press, 1992. Steve, Larry R. & Flynn, Kevin J., Flying Eagle and Indian Cent Die Varieties, Nuvista Press,Jarrettsville, MD, 1995. Taxay, Don, The U.S. Mint and Coinage, Arco PublishingCo. Inc., New York, 1966.